Enjoy our list of interesting iron & steel facts. Learn about the uses and properties of iron and steel and how they’ve been used throughout history. Find out what wrought and cast iron are, why your bike rusts, what the Earth’s core contains, what country produces the most iron, examples of iron rich foods and much more with our fun iron and steel facts. Iron is a chemical element and metal. Its chemical symbol is Fe and its atomic number is 26. When iron and oxygen react in the presence of water or moisture, rust (iron oxide) is formed. You might have noticed your bike chain (or other parts) rusting from time to time (especially if you haven’t been taking care of it). Another word for rusting is corrosion, which describes the disintegration of materials such as iron and steel. Because iron oxidizes so easily, it is rarely found in a pure metal form on the Earth’s surface. It is instead removed from ores (rocks containing important minerals and elements). Iron is the 4th most common element in the Earth’s crust, making up around 5% of the total (usually found as iron oxide in minerals like hematite). The Earth’s core is thought to be made up of an iron and nickel alloy. Gas giant plants such as Saturn and Jupiter have cores that are rich in iron. Iron is the 6th most common element found in the Universe. Steel is a well known and commonly used alloy made from iron and a small amount of carbon (or sometimes other elements). The amount of carbon is small (usually between 0.2% and 2.0%) but it makes a huge difference to the strength. Steel can be around 1000 times stronger than iron in its pure form. The Eiffel Tower in Paris, France is made from puddle iron. Puddle iron is a form of wrought iron, an iron alloy with a very low level of carbon content. Wrought iron was used commonly throughout western history but is no longer produced in large amounts due to the availability of steel. The early wrought iron used in human history actually came from meteors! The Iron Age was a prehistoric time when useful tools and weapons were first made from iron and steel. The dates this occurred in various parts of the world varies, with historians suggesting around 12th century BC in ancient Greece and 6th century BC in Northern Europe. 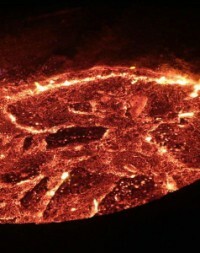 In 2006, China was the world’s largest producer of iron, making up around 33% of the world’s total production. Iron is relatively cheap to produce and has a large number of different uses. Machines, vehicles and building structures are commonly built from iron (usually in the form of steel). To prevent iron and steel suffering from rust damage, they can be painted, coated with plastic, galvanized (coated with zinc) or by other methods that keep out water and oxygen. Iron in the human body has a number of important functions including carrying oxygen to the body in the form of hemoglobin. Iron deficiency can be quite common (especially among women), with a number of possible symptoms including fatigue and weakness. Iron rich foods include red meat, fish, tofu, beans and chickpeas.